That night, the President encouraged the children to hang their Christmas stockings in his bedroom and even allowed himself to be talked into hanging his own stocking for the first time in his 68 years. Two of the children had the ingenuity to borrow the stockings of their 200 pound “Mammy” in an effort to coax some additional generosity out of Santa. On Christmas morning, the children raced into Jackson’s chamber to see what St. Nick had left. They each received a silver quarter, candy, nuts, cake, and fruit in addition to a small toy. The President received slippers, a corncob pipe, and a tobacco bag. Andrew Jackson was born in the Waxhaws, a backwoods settlement on the border of North and South Carolina on March 15, 1767. His father, Andrew, died in a logging accident shortly before his birth. His mother, Elizabeth, was a strong woman who raised Andrew and his two brothers at the home of her sister. During the Revolutionary War, 13 year old Andrew joined the Continental Army as a courier. In 1781, he and his brother were taken captive by the British and Andrew gained notoriety when he was beaten and severely slashed after refusing to clean a British officer’s boots. His treatment at the hands of his captors left him bitter and when president, he was unlikely to send any White House Christmas cards to his British counterparts. He lost both brothers during the war and when his mother fell ill and died in late 1781, Andrew found himself orphaned and alone at the age of 14. He spent the next few years living with various relatives and served for six months as an apprentice saddle maker. 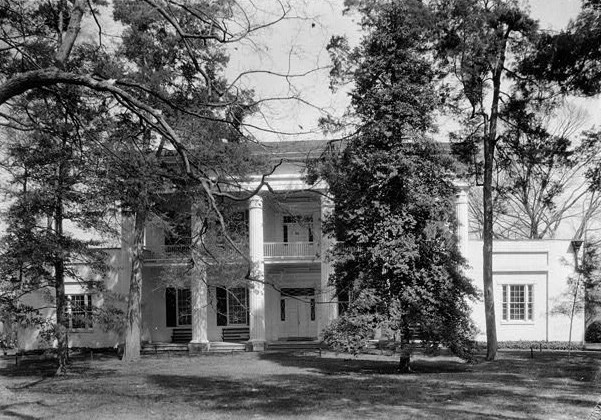 Andrew Jackson retired to his estate, The Hermitage, near Nashville where he celebrated several Christmas holidays before his death in 1845. After a brief stint as a schoolteacher, Andrew travelled to Salisbury, North Carolina to study law, was admitted to the bar in 1787, and became a prosecutor in Nashville, Tennessee. In 1796, he was elected the new state’s first congressman. He was then appointed to the senate, but resigned after one year to become a judge on the Tennessee Supreme Court. Jackson returned to the military in 1802 first as major general of the Tennessee militia and later in the regular army. He led successful campaigns against Native Americans in the Creek War and the First Seminole War. In the War of 1812, Jackson emerged as a major hero after his decisive defeat of the British at the Battle of New Orleans two weeks after Christmas of 1814. He earned the nickname “Old Hickory” for his stubbornness and focus on discipline. Jackson decided to see if his newfound fame would lead to success in national politics. He ran for president as a Democrat in 1824 and won the popular vote, only to see the election taken from him as the result of a controversial decision by the Electoral College. Rivals Henry Clay and John Quincy Adams both viewed Jackson as a western ruffian who lacked the proper education and upbringing necessary for the presidency. He had fought a number of duels over his wife’s honor, once even killing a man. Clay threw his support to Adams, who became president and named Clay his Secretary of State. It is safe to assume that neither Clay nor Adams would receive White House Christmas cards from the future president. After this misfortune, Jackson spent the next four years travelling the country, proclaiming himself the “people’s candidate” and shortly before Christmas of 1828, with poor economic conditions prevailing, he was easily elected over the incumbent president. Jackson’s wife, Rachel, died a few weeks before the inauguration. The despondent president-elect blamed his wife’s untimely passing in part on stress caused by personal attacks made during the bitter campaign. Andrew Jackson was the first president to come from humble beginnings. He effectively campaigned as a man of the people who would protect common citizens from business interests and the whims of the elite class. Jackson believed in a strong chief executive and constantly vetoed legislation he did not agree with. 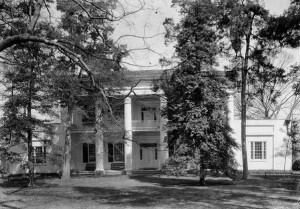 He made military preparations to enforce the tariff of 1832 in South Carolina, which had passed an ordinance refusing to comply with the federal law. A compromise tariff was agreed on in 1833 and the states’ rights doctrine of nullification was rejected by the nation. During the crisis, Jackson’s Vice President, South Carolina senator John C. Calhoun, resigned in protest. Jackson engaged in another populist controversy when he refused to sanction the recharter of the Second Bank of the United States. He viewed the bank as a huge monopoly which only operated in the interests of the upper classes. In 1833, during his “Bank War” he ordered all federal deposits withdrawn. The bank lost its charter before Christmas of 1836 and was ultimately doomed. Most historians consider Jackson’s record concerning Native Americans to be a stain on his otherwise impressive record. The Indian Removal Act was passed in 1830, pressuring tribes to evacuate 100 million acres of land east of the Mississippi for new territory in the West. 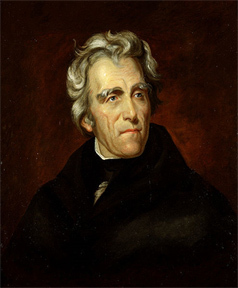 Jackson failed to uphold the legal rights of the Cherokee Indians when the Supreme Court ruled that the Georgian state government had no jurisdiction over the tribe. Shortly after Jackson left office, Georgia forced the Cherokees out. The march west became known as the “Trail of Tears,” when 25% of the Cherokee population died on their way to Oklahoma. Such an interesting man & quite a character. I’ll bet a “ruffian” like Jackson wouldn’t make it through the first round of primaries with today’s media scrutiny. Very good story, I loved the part about Andrew being the boy who didn’t know his father, didn’t know Christmas, lost his mother. Wow, I did not know anything about Andrew Jackson until I read this story.